Hey! Whoever is in charge of the weather – can you make up your mind please? One minute we’re loving the lovely sun, then suddenly we are all getting our thick winter jumpers back out the cupboard and now it’s raining. Can’t we just go back to the bright spring days please? Anyway, at least it’s the weekend! 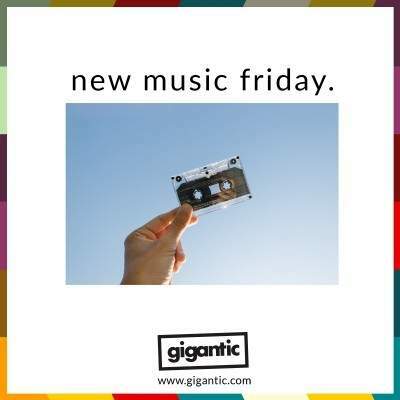 Check out your #NewMusicFriday blog and playlist, bringing you then latest in tunes, videos and tickets. Have a blast this weekend everyone! With his UK tour fast approaching, Texan Americana musician SHAKEY GRAVES (Alejandro Rose-Garcia) has teamed up with SiriusXM to make a live performance of ‘Excuses’ which gives you just a taste of the exciting shows to come. Taken from his latest LP ‘Can’t Wake Up’ which was released by Dualtone Records back in May of 2018, it really shows of Rose-Garcia’s charm and knack of just casually knocking off a flawless performance which almost threatens to hide just how talented he is. Tickets for his gigs at London, Brighton and Liverpool are selling fast. So, grab yours now! Shakey Graves tickets are currently available. ‘Kill This Love’ is the new EP from K-pop sensations BLACKPINK. Jennie, Jisoo, Rosé, and Lisa only began the band in 2016 and have already topped the charts in their home country with their awesome single ‘Whistle’. Blending elements of trap and electro-pop, their genre-mashing new track is a stomping brassy affair accompanied by a glossy video which sees the girls ride colossal swans, dance inside a giant bear trap, trash a breakfast cereal supermarket and explode a statue with the power of their minds. So, it’s not exactly low key subtle but that’s perfect for this high energy song. Brighton has long established itself as a fertile breeding ground of creativity, and its latest offering is five-piece MarthaGunn whose epic take on rock set them apart and mark them out to be the bright new hope for a British superstar band. Their members include Abi, Max, Humphrey, Ally and Frankie. Debut single ‘Saint Cecilia’ is a wonderful introduction to the rising stars unbridled passion. Produced by Kevin Jones of folk rock legends Bear’s Den, the poignant song is dripping with their 70’s rock inspiration. Released through Communion Records, ‘Saint Cecilia’ will feature on their upcoming EP which MarthaGunn promote with headline gigs at Louisiana at Bristol in April and Manchester’s The Soup Kitchen during May. They have also scored a slot at Citadel which takes place at Gunnersby Park in London on Sunday 14th of July. MathaGunn tickets are currently available. As Spring slowly emerges and we dare to dream of the hot days soon to come, Belfast boys Daniel Morgan Ball and Kris Platt aka Blue Americans are hear with their euphoric new single ‘Sunchaser’. The boys from Belfast were originally in a band called More The Conquerors before splitting off to form their experimental two-piece which encompasses elements of hip hop, blissful pop and the jubilant edge of rock. Blue Americans tickets are currently available. Having impressed absolutely everyone with their killer single ‘Bad Company’, brash Brighton quartet Yonaka are back with ‘Lose Our Heads’ – the second single to be taken from their eagerly awaited debut album ‘Don’t Wait ‘Til Tomorrow’ which is scheduled for release on Friday 31st of May on Asylum Records. ‘Lose Our Heads’ is a rallying cry against the negativity and cynicism perpetrated by social media, and will be the very first track on what will no doubt be a rousing record. ‘Don’t Wait ‘Til Tomorrow’ is entirely self-produced by the band whilst bassist Alex Crosby took care of all the engineering and shows all the signs of being a classic first LP. This year sees Yonaka properly hit the festival circuit, appearing at Neighbourhood Weekender, This Is Tomorrow and supporting Bring Me The Horizon for their all dayer at All Points East plus kicking off their own Summer tour in May! Yonaka tickets are currently available.